In September 2014, Seppeltsfield Vineyard Cottage was proclaimed an inaugural Barossa Trust Mark recipient in good company with other Barossa businesses including Rockford Wines Basket Press Shiraz, Henschke Hill of Grace Shiraz, Linke’s Mettwurst, Apex Bakery 1924 ferment, Peter Lehmann’s Margaret Semillon, and Seppeltsfield’s Para 100 Year Old Vintage Tawny. We are honoured to have been awarded 7 South Australian Tourism Awards and 4 National Tourism Awards since 2005. Winner 2005 Australian Tourism Awards – Hosted Accommodation. Entry for the second time into the SA Tourism Awards Hall of Fame. 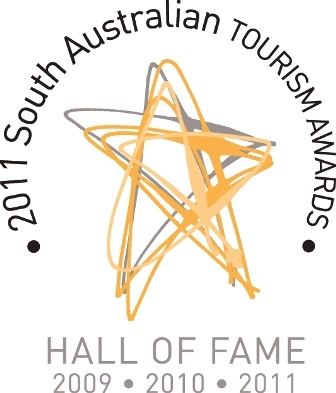 Winner 2011 South Australian Tourism Awards Hosted Accommodation. Winner 2010 South Australian Tourism Awards Hosted Accommodation. Winner 2009 South Australian Tourism Awards Hosted Accommodation. Winner 2009 South Australia Tourism Awards Heritage & Cultural Tourism. Entry into the SA Tourism Awards Hall of Fame. Winner 2007 South Australian Tourism Awards Hosted Accommodation. Winner 2006 South Australian Tourism Awards Hosted Accommodation. Winner 2005 South Australian Tourism Awards Hosted Accommodation. After entering the awards for seven years from 2005 to 2011, Sharyn became a member of the South Australian Tourism Awards judging panel for 2012, 2013 & 2014. This means Seppeltsfield Vineyard Cottage can obviously no longer enter the Tourism Awards but Sharyn enjoys contributing to the Awards process and the benefits the Awards bring to operators, the industry and ultimately to travellers.